oftwominds-Charles Hugh Smith: Is This Why Productivity Has Tanked and Wealth Inequality Has Soared? Needless but highly profitable forced-upgrades are the bread and butter of the tech industry. One of the enduring mysteries in conventional economics (along with why wages for the bottom 95% have stagnated) is the recent decline in productivity gains (see chart). Since gains in productivity are the ultimate source of higher wages, these issues are related. Simply put, advances in productivity are core to widespread prosperity. 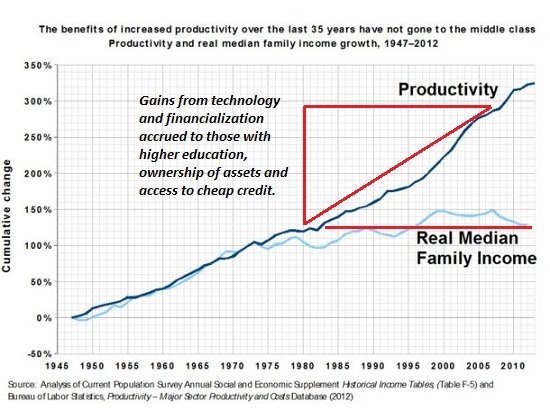 But that's only half the problem--productivity gains have flowed to the top of the income-wealth pyramid as financialization and cartels have replaced real-world wealth creation as the source of wealth-income. Longtime correspondent Zeus Y. recently identified one cause of declining productivity and the narrowing of financial gains in the top: the quasi-cartels that dominate our economy profit by introducing and maintaining inefficiencies, not eliminating them. This runs counter to the accepted wisdom in classical free-market capitalism that generating efficiencies increases profits. "With Big Data and Big Profit dominating the products, services, and platforms of everything from iOS operating updates to delivery of healthcare, let's make the plain-as-day argument: PROFIT and EXTRACTION MEANS PRODUCING INEFFICIENCIES, NOT ELIMINATING THEM. They make their money by creating inefficiencies, bottlenecks, and gatekeepings that they can profit from. Every middleman function they can stick in their system is a potential profit source for them. This was especially apparent to me in all the bugs I have experienced with Apple upgrades on my phone. I have to take the time to fix their screw-ups, which are designed to aggregate my data and usage to profit them. You see this with the manipulation of Facebook, creating a very black and white world that motivates and manipulates people to a froth with filters and algorithms that reinforce their biases. This is not free and democratic access, but inefficient and narrow manipulation, cutting down on alternatives, possibilities, and better ways to think and do. What would a more efficient and democratic system look like, one where access, freedom, and, yes, real efficiencies (especially democratic and community efficiencies) would predominate?" Thank you, Zeus. As Marx observed 150 years ago, the most profitable arrangement is monopoly, or failing that, a cartel that controls a specific market. Thus it is no surprise that Google, Facebook and Amazon are attempting to become quasi-monopolies in their respective spaces, just as Standard Oil gained a near-monopoly on the oil market in the early 20th century. Corporations no longer seek a coercive old-style monopoly that violates anti-trust laws; today they eliminate competition by scaling up to dominate a sector. I covered this in Are Facebook and Google the New Colonial Powers? (September 18, 2017). Once a corporation achieves dominance, it can impose profitable inefficiencies (for example, healthcare and higher education), force customers to perform labor that was once done by companies as part of their service (self-checkout, endless software updates), and profit from customer data with little fear of blowback: now that you need us, we can extract maximum profit from you without fear of regulation or competition. Once customers are dependent (or addicted, in the case of opioids, mobile telephony, Facebook, etc. ), then corporations can impose all sorts of burdens on their customers and demand annual ransom, a.k.a. software licensing and/or update fees. Consider Microsoft's dominance in operating systems and Office. Microsoft can sell buggy, insecure software, and require constant purchases of "upgraded" software that has lower functionality than the product it replaces. The same dynamic is in play with Apple and Android OS in the mobile space. I was recently forced to upgrade my perfectly functional iPhone 4 because some apps only work now in the latest iOS. Meanwhile, Windows 10 is demanding I upgrade my BIOS so my laptop can accept the latest Win10 update. Needless to say, Microsoft offers zero assistance beyond the nag-box. Needless but highly profitable forced-upgrades are the bread and butter of the tech industry. If we actually valued efficiency and productivity, our system would encourage durability, efficiency and reducing waste. Alas, all three of these worthy traits drastically reduce profits, so instead our maximizing profits by any means available system incentivizes planned obsolescence, inefficiencies controlled by cartels and endless waste of goods, services, customer time and resources. 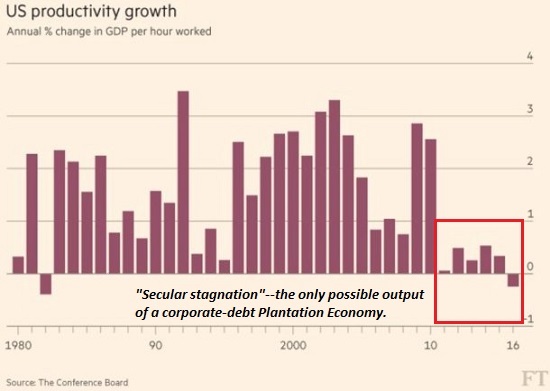 The immense profitability of inefficiencies controlled by monopolies, quasi-monopolies and cartels is a key reason productivity has faltered and gains flow only to the top. There are other models for distributing software and services, for example, open-source software. There are other models of ownership, for example community ownership of resources and enterprises. But given the financial and political dominance of cartels, these options have been neutered or marginalized. Thank you, Joel S. ($5/month), for your superlatively generous pledge to this site-- I am greatly honored by your support and readership.